Ready For Your Car To StickOut? Are you ready for your car to stick out? 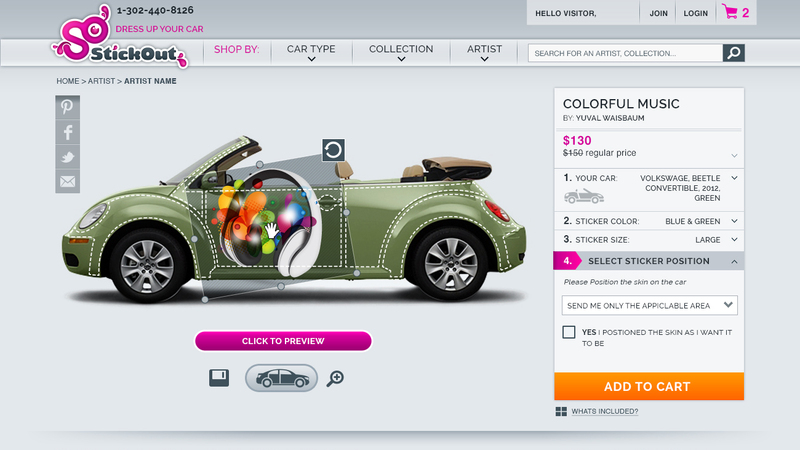 Now your car can be customized to your own liking. Personalization or mass customization is a huge consumer trend. Today’s personalized mobile phone skins and custom graphic clothing point to an increasing demand for one-of-a-kind commodities by consumers who want to be an active part of the design process. But, the automotive industry has been slow to respond to the big personalization mega-trend dominating other markets. Until now, exterior car customization options have been limited to a small selection of car stickers that must be professionally installed and are expensive plus damaging to remove. 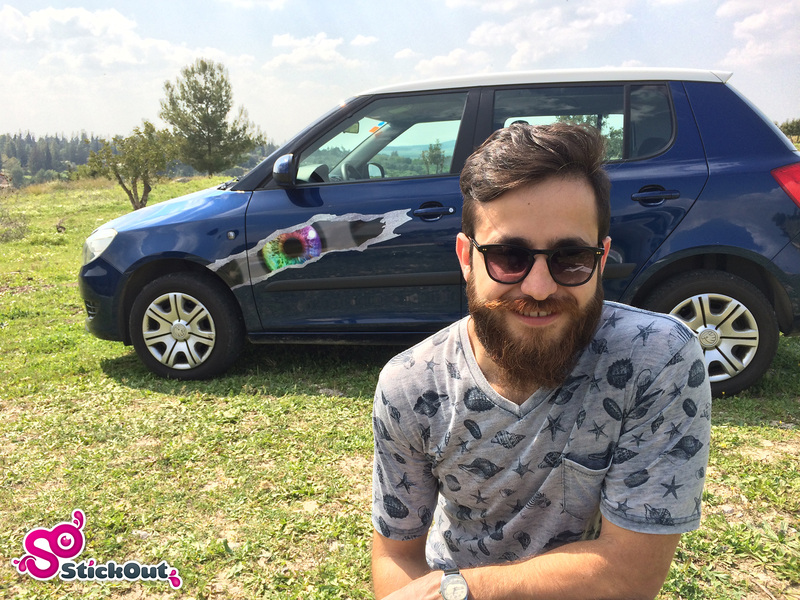 StickOut, is the first car graphics marketplace to individually cater to a broad spectrum of consumers looking to customize their cars. StickOut’s Style Lab is a unique, innovative interface that allows users to select, position, and visualize any one of thousands of beautiful designs from artists around the world. StickOut launched its $20K Kickstarter campaign and is over halfway to their goal. The company plans to devote funds to further develop its web platform and take its Style Lab to the next level by allowing users to upload their own designs and logos. I got to talk to Gera Waisbaum, Co-Founder and CEO of StickOut. Below is some of what we discussed. TD: Tell us a bit about yourself personally. Where you’re from, Where you live now, What motivates you? My name is Gera Waisbaum and I’m 45 I was born in Argentina and I currently live in Israel. When I was 18 my family moved to Israel where I made my first degree in Electrical Engineering in the Technion (Israeli Institute of Technology). During my senior year I started to work in chip design in Galileo, a small startup. The company grew pretty fast, went public and eventually was acquired by Marvell. I held several position in the company from development through development management to marketing in the headquarters of the company, in San Francisco Bay Area. After Marvell I had my first incursion in the entrepreneurial world and founded BigDeal.co.il, one of the biggest daily deals websites in Israel which we sold to Ynet (the biggest news portal in Israel). After Bigdeal I got back to work “for the boss” in Zoran where I served as business manager for three years until I decided to quit to create StickOut. TD: What interests you about the travel/transport space? Although my background is not in arts, I was always fascinated by design, architecture, photography and…cars. That’s why when StickOut’s idea came up, I instantly knew that it is a perfect match for me. I couldn’t conceive that people nowadays personalize EVERYTHING, from content, through clothes and phone cases to even prosthesis (I learned about this amazing company called Bespoke Innovations which is doing an amazing job making unique prosthesis). So why do all cars look the same and say nothing about the people driving them? I knew from that moment that I have to do something about that. TD: What problem are you trying to solve? 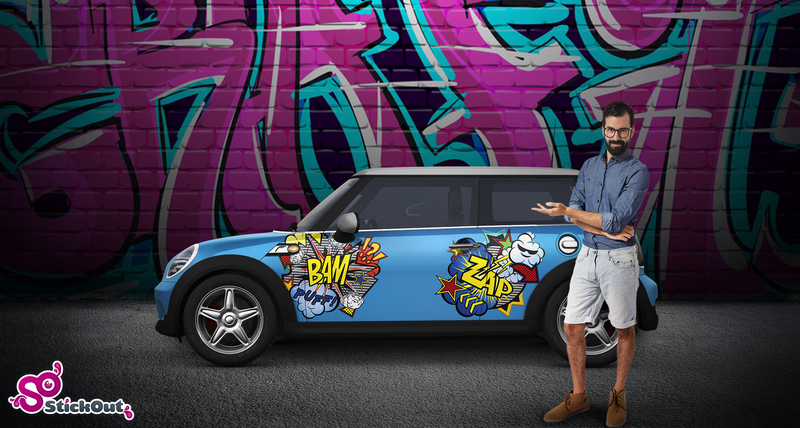 I want to make accessible for people to personalize their cars. 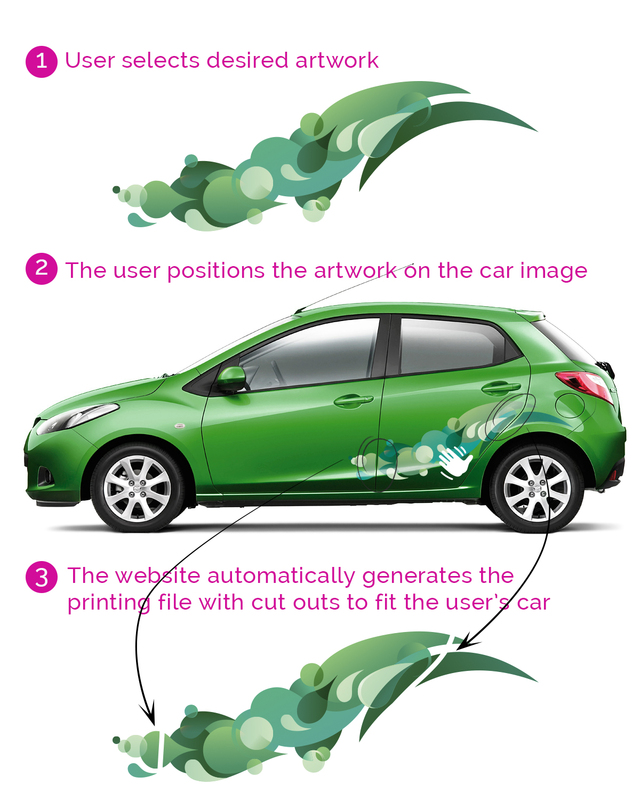 Existing options are quite cumbersome and expensive: you have to find a local business that does car wraps or car painting, have them create a custom design according to your needs, leave the car for a day or more for installation, and pay significant amount of cash to just give a personal touch to your car. The alternative is to online purchase car stickers of questionable quality and limited design variety. TD: Do you have a message for our audience, that they could take away with them? Personalization is one of the mega trends and the car industry is slowly understanding that. Almost all car makers are now offering some kind of customization options. This is a live proof of what we saw coming. It took more than a year and a half to develop StickOut platform and it paid off since the whole flow works even better than planned. Our next step is to give the people the chance to upload their own designs. This also allows us to open StickOut platform for small/medium businesses looking to brand their fleet. TD: What’s your best piece of entrepreneurial advice in one sentence? Follow lean startup methodology: build MVP, measure, learn and then pivot or persevere.